What’s with all that racket? 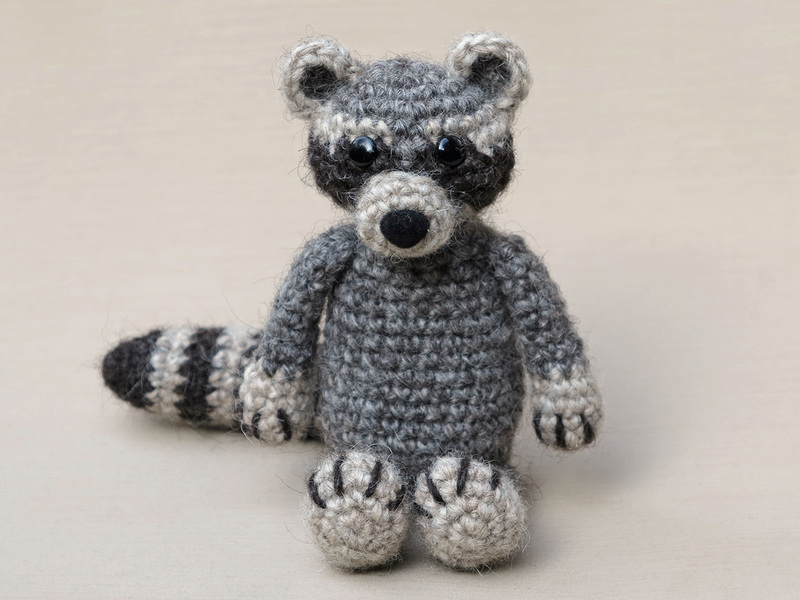 It is Wasby, my new crochet raccoon pattern. Here he finally is! I’ve called him Wasby, as raccoons are called ‘wasbeer’ in Dutch. With a nice frontal picture, meet my crochet raccoon! This crochet raccoon pattern was a bit of a tricky one to make. When I started, I had many ideas of how to make this animal. I didn’t want the head to be round but it had to have wide cheeks like a real raccoon. The thing I had in mind of how to shape those cheeks didn’t work out that wel, so I had to think of something different. Also, the raccoon should not become too chubby, but just a bit, which meant I had to make a bunch of bodies before I got the right size. I wasn’t sure about the right colour for the hands and feet….dark or light? I made some test versions and decided to go for light and added some extra little details with the dark yarn. I am very pleased with the end result. Wasby has become the raccoon doll I pictured. He has the right proportions and I love his realistic looking face. The fun thing about patterns like these are, you can do whatever you like, if you prefer dark feet, just go for dark. 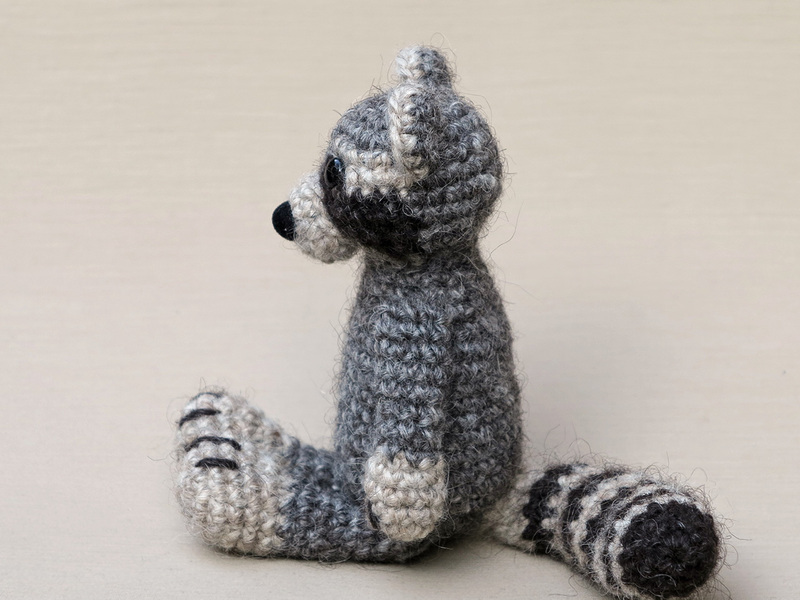 I’ve chosen rustic colours to make this raccoon, but white, grey and black will do too. You could even give the raccoon a more brown fur colour instead of grey. Here are some more pictures of Wasby and below them you can find info about and links to buy this pattern. Isn’t he a ferocious little crochet raccoon? This is my favourite picture of him. Wasby is sitting 5.1 inch/ 13 cm tall. The crochet pattern for Wasby the raccoon you can find in my shop and in my shop at Ravelry. Wasby is made with Lett Lopi, a 100% wool. I have chosen to use a light beige for the light parts of the raccoon and the darkest brown you can find for the dark parts. It gives him a more warm and rustic look. In the pattern you can find a clear and colour coded description of how to crochet and assemble this animal, with extra illustrations and example pictures at the bottom to help you get everything right. 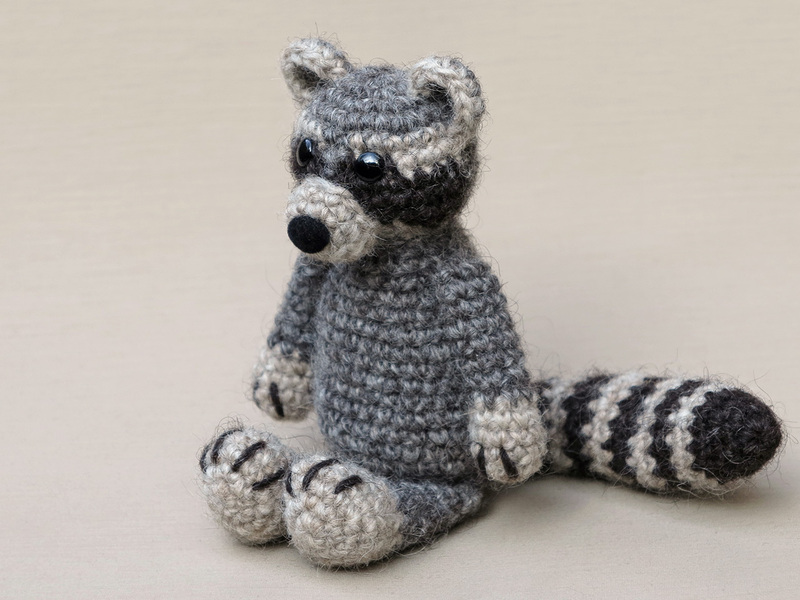 In the pattern you can also find what materials you need, the yarn colour numbers, in short, everything you need to know to make your own whimsical raccoon amigurumi. All the additional information you need to know about this pattern you can find in the shop listings. Hi, I purchased your pattern for this cute little guy on craftsy and I was wondering about the nose. It looks to be crocheted but the pattern calls for animal safety nose. Do you have the direction for a crochet nose? It is a safety nose. If you crochet one, try to make a magic ring as small as possible and close it right away.